AuCom soft starters improve safety for Chilean copper mining industry. Northern Chile is home to some of largest copper mines in the world, but the desert conditions, high altitude and extreme temperatures make road transport extremely dangerous. AuCom soft starters have enabled key materials to be exchanged between mines through pipelines, improving efficiency, reducing road traffic and avoiding accidents. 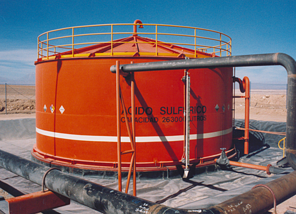 Sulfuric acid is used during the processing of copper ore, and is also a by-product of the processing. It is common for one mine to have an excess of the acid while another mine has a shortage, so the product is often shared between locations. Previously, 25 heavy trucks travelled the roads between the Chuquicamata and Rodomiro Tomic mines every day, laden with their dangerous cargo. Accidents were common, leading to an increasing interest in pipelines to carry the acid and minimise the transport hazard. In 2004, Codelco mining company approached AuCom’s representative in Chile, Rhona, to help assess the feasibility of transporting the acid via pipelines. A 25 km pipeline with a 400 m altitude difference was constructed between Chuquicamata and Rodomiro Tomic, powered by 8 pumping stations. The stations are monitored and controlled by Modbus on an Emerson Delta V SCADA system. Northern Chile’s rich mineral resources make it one of the world’s largest sources of copper. With extreme climate conditions and an altitude of more than 3000 metres above sea level, the mines are an extremely arduous operating environment. AuCom soft starters have allowed hazardous substances to be transported via pipelines, removing 25 heavy transport trucks per day from the roads and avoiding a considerable number of accidents. AuCom soft starters are used in conjunction with inverters, and the system is controlled by Modbus SCADA.